Too many girls are dropping out of sports programs at an early age. Sports and recreation programs, including high school-based physical education (PE) classes, can help girls develop a lifelong love for physical activity and an overall sense of wellness. However, many of these programs emphasize competition, often putting pressure on individual achievement. Research shows that many girls begin to associate feelings of anxiety, guilt, and embarrassment with sports and competition when they enter their early teen years. Girls often report feeling embarrassed by comments about body shape and physical ability. Often create feelings of judgment and shame around individual abilities. Enjoy inclusive activities that emphasize teamwork and collaboration. When girls have a chance to participate in programs that reflect their priorities, they sign up, stay committed, and often convince their friends to join too. 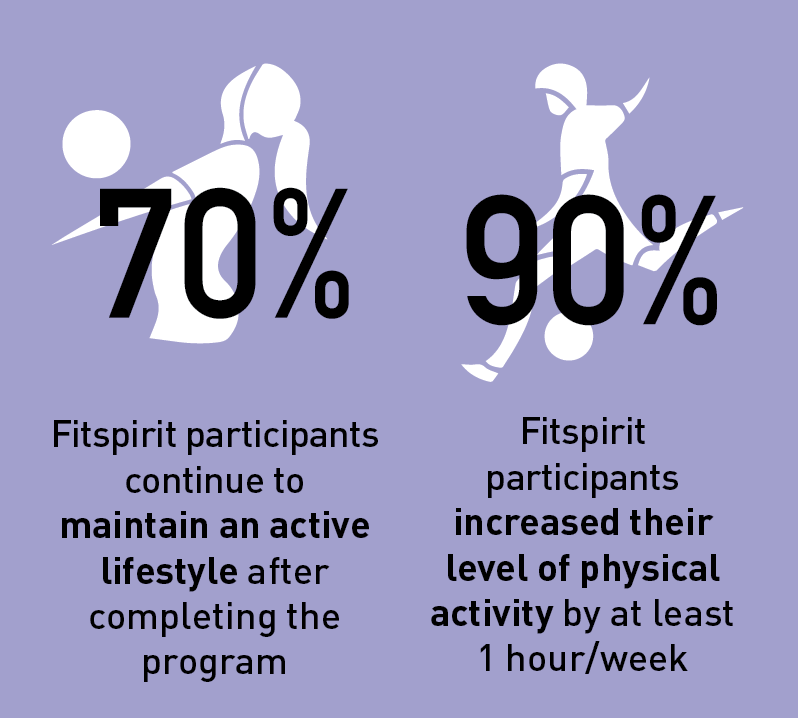 For over ten years, FitSpirit has been encouraging girls to get active through empowering programs and activities, based on support, inclusion and fun. Through these initiatives, FitSpirit is motivating girls to rethink physical activity and wellness. Since 2007, FitSpirit has worked with 150,000 girls, and the organization intends to continue its work to get even more girls moving. FitSpirit is catalyzing a unique approach to physical and mental wellness in schools that has the potential to influence future generations of Canadians. FitSpirit’s programs and activities are founded on a holistic approach that prioritizes girls’ preferences for flexible, individualized options. Through motivational presentations, running programs (5k and 10k), celebration events and more, FitSpirit offers ways for girls to support one another, test personal limits, build self-esteem, and adopt active lifestyles in a non-competitive environment. Additionally, FitSpirit trains young women as Student Leaders so they can support the deployment of FitSpirit activities in schools. Student Leaders recruit, support, and motivate other students, help facilitate activities and, in doing so, develop important, confidence-building skill sets. FitSpirit is now diversifying its physical activity options so that girls can discover even more ways to have fun and keep fit. To do this, FitSpirit is exploring partnerships with other sports federations. Going forward, FitSpirit will continue to work with schools and community organizations to build healthy activities for girls, but will shift its focus toward larger, more impactful changes in school culture. FitSpirit will work with school boards, sports organizations and community organizations to create lasting transformations that will impact future generations of girls. Ultimately, FitSpirit is working to equip schools with the tools they need to manage FitSpirit activities independently in order to inspire as many girls as possible to commit to a healthy lifestyle. When girls are engaged in physical activity, great things happen. Studies show that girls who commit to an active lifestyle at a young age are more likely to maintain that lifestyle long term. Additionally, if young women stay committed to a healthy lifestyle, the benefits are likely to be passed on to future generations. Research indicates that women who participate in sports and recreation develop confidence and leadership skills that contribute to their academic achievements, professional success and level of social connectedness. In fact, 94% of women working in “C-suite” positions played sports and 52% of those played sports at a university level. By communicating with schools and school boards across the country, FitSpirit is encouraging teenage girls, their teachers, their principals and community leaders to rethink the future of sport, recreation and wellness programs. Foster a safe learning environment that includes friends, fun, and multiple levels of support. Sport and recreation programs can provide a holistic approach to wellness. This approach will allow teachers, principals, and community leaders, among others, to realize that there are opportunities to embed values of wellness into all types of programs, even those that go beyond sports or recreation. Canada is working on a plan to create a social innovation and social finance ecosystem that could better support initiatives like this one. Find out more at sisfs.ca. McConnell supported FitSpirit through a $225,000 grant from the Social Innovation Fund, and provided coaching through the Social Innovation Learning Program.